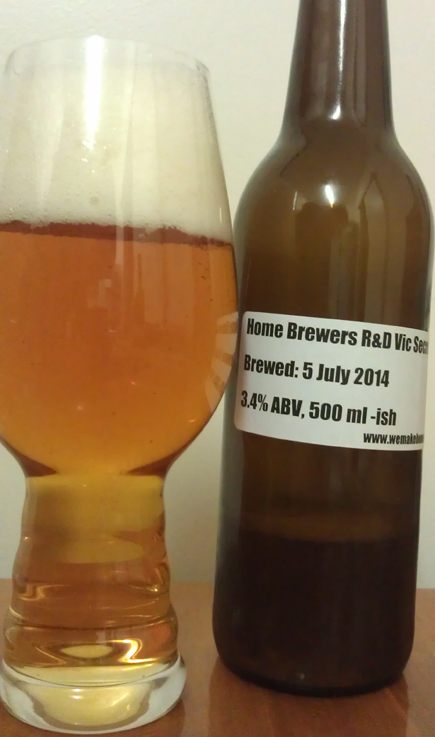 Quite a few moons ago I finally did my first all grain brew, Home Brewers R&D Vic Secret. It was an interesting process and at the end I had some beer. I’ve tried it and shared it with a few people. This review will try to do capture all that feedback, not just my take. Firstly let me be clear, something went wrong with this beer. Not sure exactly what and most likely it was a number if things. Process is probably the main culprit, maybe water too. This beer was part of a group of beers. An attempt with some other home brewers to all make the same beer but with different hops. The other two guys have been making all grain beers for a while and their beers turned out good. What is important is that the recipe was fine. My brew was a smaller batch due to equipment. Keeping ratios right wasn’t an issue as calculations weren’t left up to me. All I needed to do was get the grain, hops, yeast and follow the instructions. I got a bitter and dry beer. When I say bitter, I mean chemical and tart. Not good. The aroma is nice. You can smell the passionfruit and pineapple, a nice sort of fruit hint. That sort of comes out when you taste it. Then the bitterness kicks in and takes over. This is a quite clear beer as brewbrite was added. It’s a lot clearer than every other beer I’ve made. Will be using this for a lot more brews in the future. The body here is nice enough. Clearly being an all grain makes this better than quite a few of my extract beers. It has a nice mouth filling element as well. Alcohol is lower than it should have been, coming in at only 3.4%. That’s because there wasn’t enough maltose converted from the grain. Overall this is a hard beer to enjoy. The bitterness is too much. If it was half as bitter it would be about right. As a result I’ve been mixing this with the Super Stout (which was also a bit stuffed). Next time there will be a lot more care in making an all grain.